This was definitely a real Wi-Fi kind of weekend. First we have a major melt down of the Rogers 3G Internet Hub which gives us internet connectivity in the cottage. It was so hot Bruce almost burnt himself. Once it cooled down, we powered it up and it still worked. Amazing! And speaking of Wi-Fi, the most recent engineering standard for Wi-Fi was released by the Institute of Electrical and Electronics Engineers (IEEE). It is officially called 802.11ac. Yup; that's right, I finally have what I need to invent my latest "Kottage Kreation". Introducing "The 802.11ac Wi-Fi Cordless Extension Cord". The ultimate power accessory for the cottage. I have done two versions. The single outlet receiver is for smaller appliances like lights and radios. The big 4 outlet version can pull 15 amps and is capable of running power tools like a circular saw or demo saw. Now there is a word of warning though. 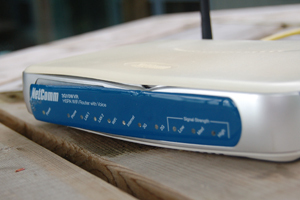 This standard is dual band which means it runs on both 2.4 GHz and 5.0 GHz. These frequencies are microwave levels so if you are pulling 15 amp of ac power over this then you don't want to stand between the antennas or you just might cook something. It will at least help keep you warm in the winter. Our beer of the day is Barking Squirrel Lager. It comes from Hop City Brewing Co in Brampton Ontario. A special thank you to JEREMIAH FLEMING of podsafeaudio.com for his composition titled "Overnighter" which is the intro and outro music on this episode. Episode #054 "The Water Garden Beer Chiller Hot Tub." This was a ton of fun. When we decided to get rid of the old paddle boat back in Episode #052, I already had plans for the hull portions of the pontoons. I knew I could put them to use and boy did I ever. After I cut up the old paddle boat with my Dewalt DW304PK Reciprocating Saw I had to come up with something to do with the leftovers. I was inspired by the pond tours put on by the Ontario Water Garden Society. I decided to expand on the experience I had gained from water gardening at home so I brought it up to the great white north, kottage-tek style. 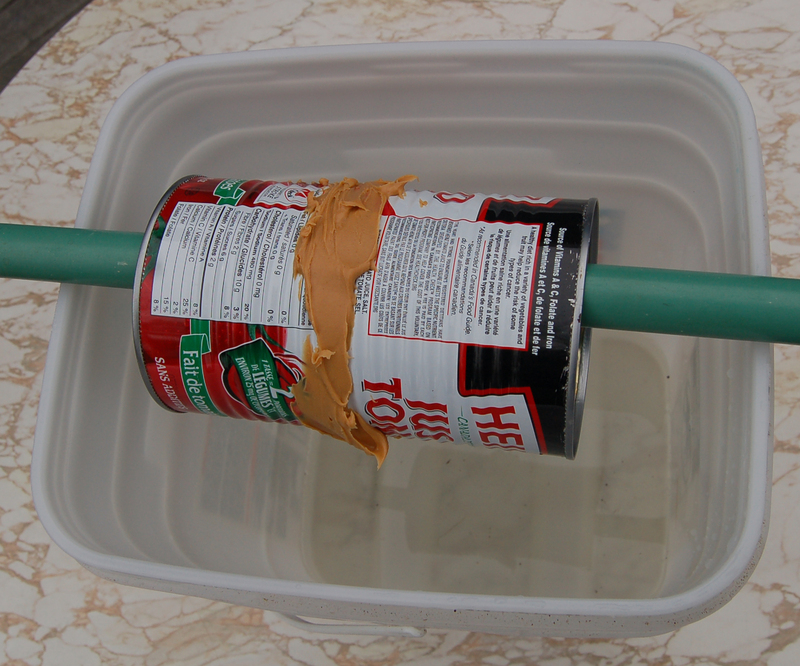 I used one of the hulls and installed a Laguna PowerJet 200 pump with a Laguna Foam Jet head. I added some local water lillies harvested from the lake and some little rubber duckies and presto, The Kottage-tek Water Garden. The next step was to add some ice and a case of beer. I also tossed in some cans for Bruce and a bottle of Chardonay for the ladies and now I had "The Kottage-tek-Water Garden-Beer-Chiller" We were set for happy hour. 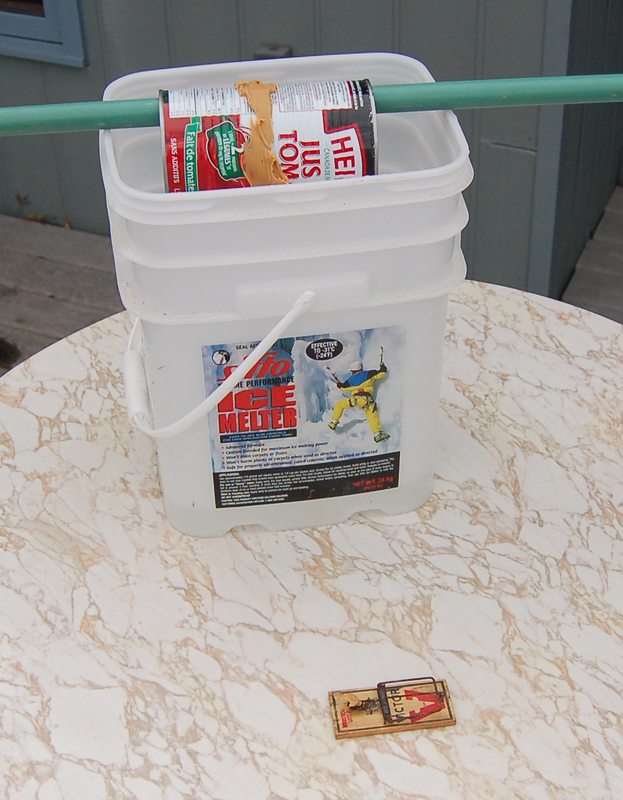 After dinner when things cooled off a bit it was time to throw in the Thermo Pond Heater. This unit is designed to run on 120 volts but I wired it up to 220 for some extra BTUs, and boy did it work. 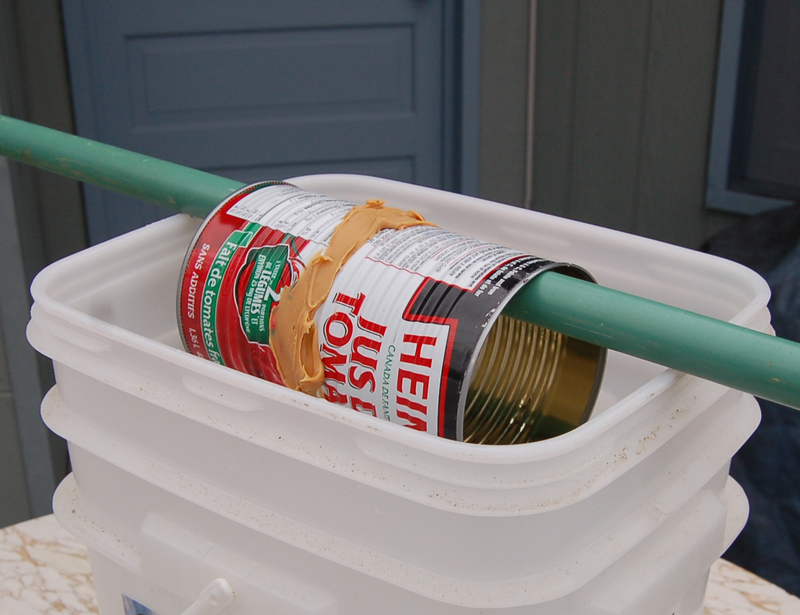 Within a few hours I now had "The Kottage-tek Water Garden Beer Chiller Hot Tub". 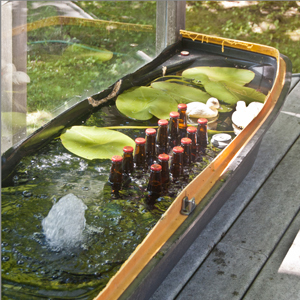 This is a true multi function installation that everyone will want at their cottage. Forget the mega cottages that form millionaire row on Lake Rosseau. They ain't got nothing on this creation. Since I was working on a water project and Bruce was just back from the east coast, what could be a more fitting beer of the day than Propeller Extra Special Bitter. It comes from The Propeller Brewing Company in Halifax Nova Scotia. You can find more about them by visiting www.drinkpropeller.ca. Episode #053 "The "BEER ME" Zip Line. Another great muskoka week has gone by. We had alot of fun, even the spring cleaning part which Bruce seemed to avoid. We also discovered a major problem at the cottage. Either the dock is too far from the beer fridge, or the beer fridge is too far from the dock. It took a bit of head scratching but we finally came up with a rather creative solution. The Kottage Kreations "Beer Me" Zip Line. And best of all, it works. 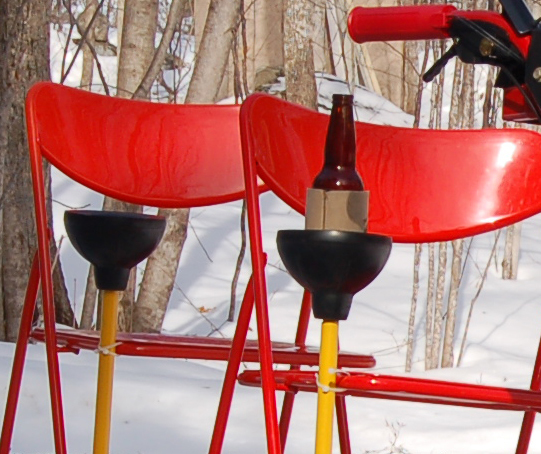 I even rigged a camera dolly using a toilet plunger so I could take you for a ride with a couple of beers. 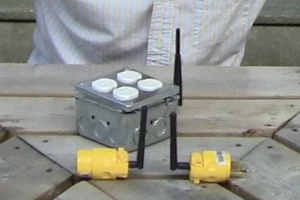 You have to check out the video on the kottagetek YouTube channel.. There will be links on the kottage-tek.com website. Look for kottage kreations. You know I never thought a clothes line could be so useful and as long as we can keep the women folk happy, we are golden. I should probably start working on the beer can cannon but we just don't like those silver projectile things. Maybe I could fire them at the heron the next time he tries to pilfer our local chipmunk population. Poor little chipmunks. Karen even had names for those little guys. 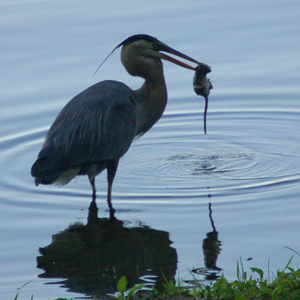 Who would have thought that a great blue heron would come in and eat them like chipmunk nuggets with six mile lake dipping sauce? This time we tried something really different for our beer of the day. We went way back in time. To a time when life was simple. Back to the pioneer days. We went to the Black Creek Pioneer Village in north Toronto Black Creek Pioneer Village. This is where we found the Black Creek Historic Brewery. Here is where I picked up some Black Creek Pale Ale. A damn fine brew and since it was brewed in a historic village from the 1800's, it is certainly well aged. First we identify the problem, then build some variables, then solve it once and for all! 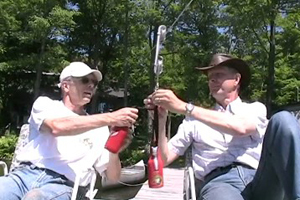 This shows how I built the Kottage-tek, Kottage Kreations "Beer-Me" Zip Line. We also take you for a ride! Seriously! Episode #047 "The Touring Troy Bilt"
Bruce pulls the trigger on a real sweet Troy-Bilt snow blower at Canadian Tire's Midland store. It's got all the toys including heated handle grips and a joystick control for the chute. TroyBuilt 24" 208cc. Of course Cliff is never one to leave well enough alone and he was inspired to create one of his best projects to date. 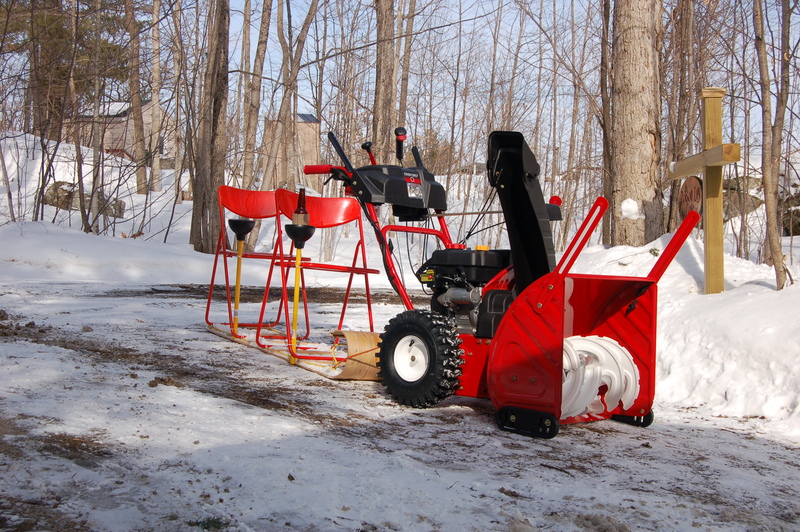 The "Touring Troy-Bilt". 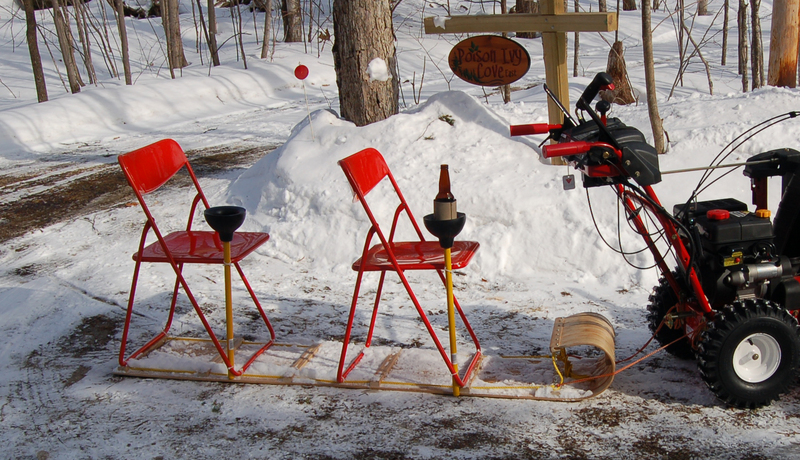 He used a toboggan, a couple of Ikea chairs, and two toilet plungers from the Home Hardware store in Coldwater. Cliff assembled it all with nylon zip ties, hitched it to the back of the Troy-Bilt and voila the Touring-Troy-Bilt. 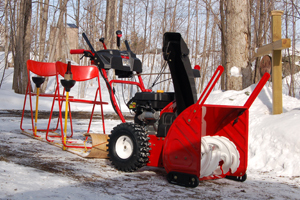 A real go-to-town machine for the winter. No need to wait for the OPP to open the roads after the lake effect snow finally stops. Simply drop your honey on the jump seat, fire up the auger, throw it into high gear and head to town. Just remember, if you are heading into town make sure its hot cocoa in those cup holders. Remember, don't drink and drive. Not even on a snow blower. Make sure you check out our YouTube channel at youtube.com/kottagetek. 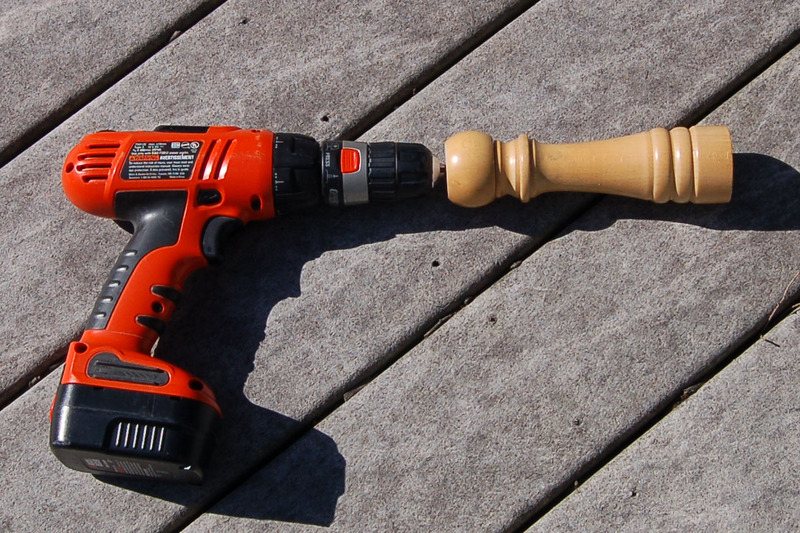 Episode #039 "The Cordless Pepper Mill"
Cliff looks to build another over the top project for the cottage. This time it is the cordless peppermill. We spend a lot of time cooking at the cottage, especialy BBQing steaks. This inspired Cliff to come up with a better way to season up all those steaks without wearing out the shoulder muscles. It doesn't matter if its steaks on he BBQ or pasta night. This handy kitchen gadget makes quick work out of satisfying all the pepper heads. Here is how he did it. First he picked up a decent quality peppermill from Cayne's Super Warehouse Store. He went with an inexpensive wooden model made by Trudeau. 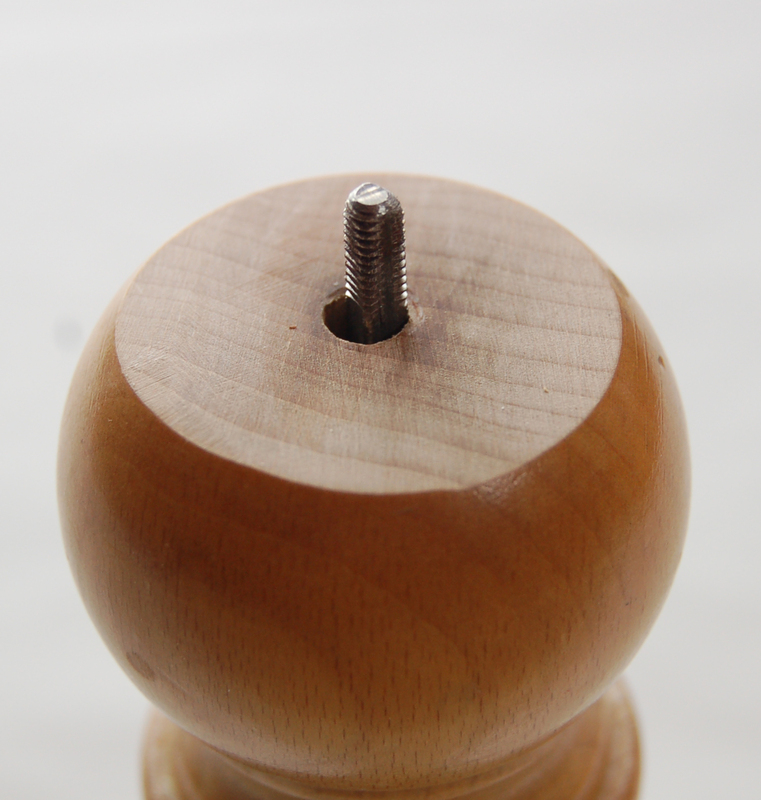 He then made a simple modification to the top of the peppermill by sanding it down flat with his belt sander. This made the metal rod stick farther out the top allowing for the drill chuck to grab onto it. Speaking of drill chucks Cliff went with his own personal Black and Decker 12 volt Firestorm cordless drill. The special feature of the Firestorm series is the removable chuck. 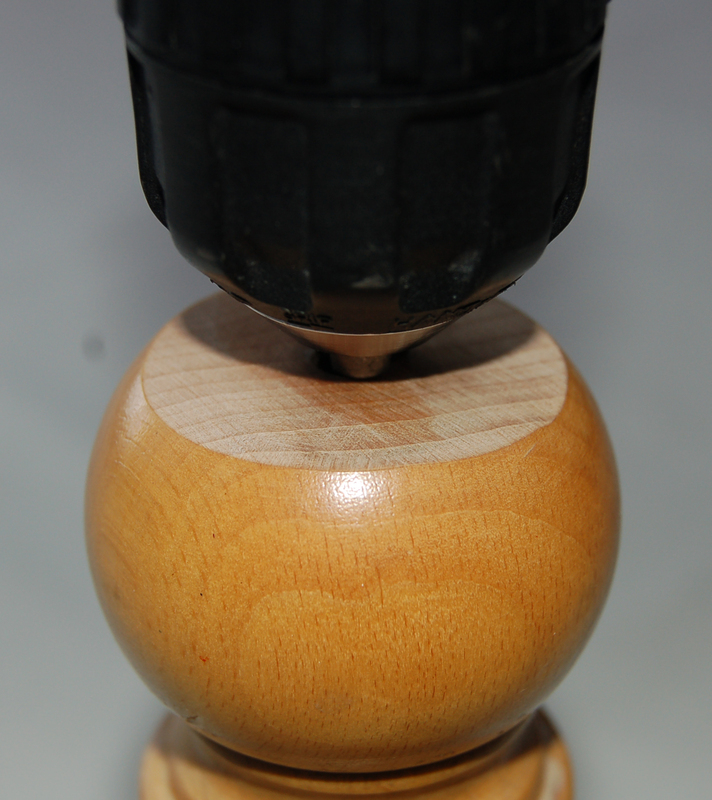 This allows the peppermill to be used at the table as a conventional manual peppermill. You can also snap it onto the 12 volt cordless to convert it into a powerfull pepper producer. The nice thing about the Firestorm series is that the chuck in interchangeable across the product line so you can easilly snap the peppermill onto the big 24 volt for heavy duty work. And with several battery packs on hand, there is no stopping the flow of seasoning goodness. 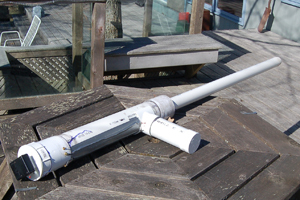 Episode #038 "The Potato Cannon"
Cliff builds a potato cannon, but not just any potato cannon. It uses a combustion chamber recirculation fan and a more high tech fuel than hairspray. Thanks to a Pentium 4 cpu fan and a can of spray ether, this baby packs quite a punch and Cliff is already planning the thanksgiving dinner. Of course we couldn't build something like this without paying homage to The Royal Canadian Air Farce and their "Chicken Cannon". A true inspiration. For this episode we tried something different. Lug Tread from Beau's All Natural Brewing Company located in Vanleek Hill Ontario. Not one of our favorites but you may like it. If you do try it, tell us what you think. Episode #037 "The Mousey Spa"
The Mousey Spa is actually the most efficient and productive mouse trap ever seen in kottage kountry. 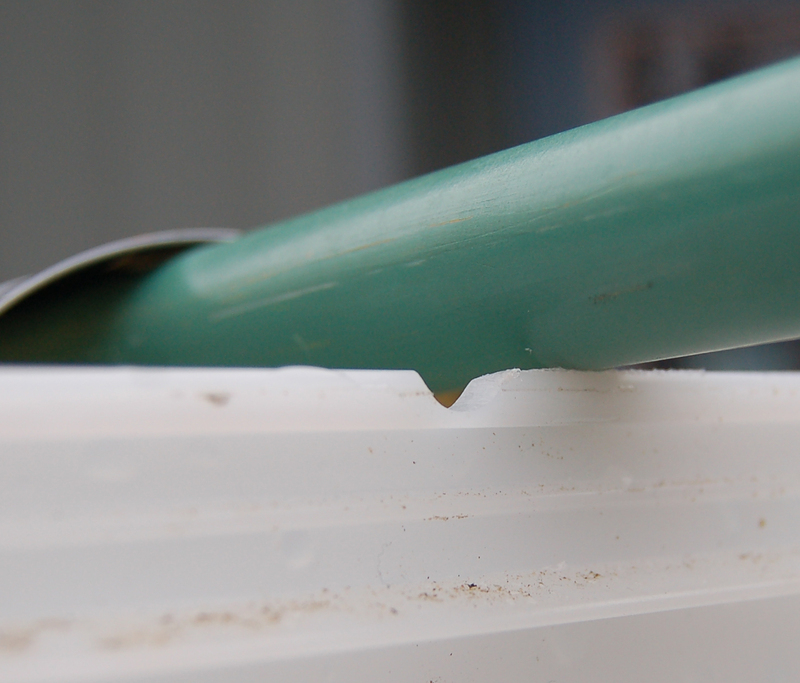 It works continuously over long periods of time, and is a snap to clean out and reload. 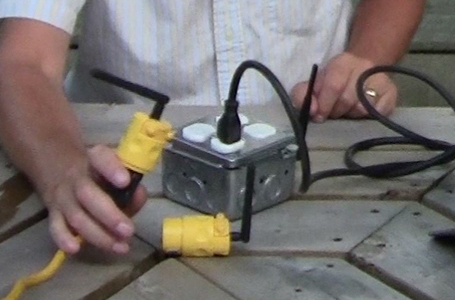 In this episode, Cliff gives a quick how-to for building your own "Mousey Spa". Bruce and Cliff have often spoken about the infamous "Mousey Spa" which serves as the primary rodent deterrent system at the cottage. It is actually located in the crawl space underneath the cottage and is intended to capture the mice before the either get into the main part of the building, or cause any damage to the stuff in the crawlspace. Cliff set up video surveillance on the mousey spa last summer and even gave it a wireless video stream.